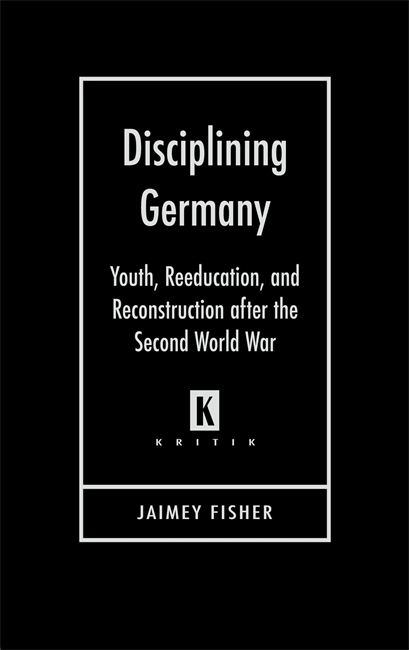 Disciplining Germany is a welcome addition to and firm departure from current studies of postwar reeducation and Vergangenheitsbewältigung: by displaying the subtle manner in which politics played into the narrative and philosophical discourses on youth and generation, Fisher skillfully illuminated the political role of the cultural imaginary of youth in the budding German nations. During Hitler’s reign, the Nazis deliberately developed and exploited a youthful image and used youth to define their political and social hierarchies. After the war, with Hitler gone but still requiring cultural exorcism, many intellectuals, authors, and filmmakers turned to these images of youth to navigate and negotiate the most difficult questions of Germany’s recent, nefarious past. Focusing on youth, education, and crime allowed postwar Germans to claim one last realm of sovereignty against the Allies’ own emphatic project of reeducation. Youth, reeducation, and reconstruction became important sites for the occupied to confront not only the recent past, but to negotiate the present occupation and, ultimately, direct the future of the German nation. Disciplining Germany analyzes a variety of media, including literature, news media, intellectual history, and films, in order to argue that youth and education played a central role in Germany’s coming to terms with the Nazi past. Although there has been a recently renewed interest in Germany’s coming to terms with the past, this attention has largely ignored the role of youth and reeducation. This lacuna is particularly perplexing given that the Allies’ reeducation project became, in many ways, a cipher for the occupational project as a whole. Disciplining Germany opens up the discussion and points toward more general conclusions not only about youth and education as sites for wider socio-political and cultural debates but also about the complexities of occupation and the intertwining of different national cultures. In this investigation, the study attends to both "high" and "low" cultural text—to specialized versus popular texts—to examine how youth was mobilized across the generic spectrum. With these interdisciplinary approaches and timely interventions, Disciplining Germany will find a diverse readership, including upper-division and graduate courses in German studies and German history as well as those general readers interested in Nazi Germany, cultural history, film and literary studies, youth culture, American studies, and post-conflict and occupational situations. Jaimey Fisher is assistant professor of German and Russian at the University of California, Davis. Fisher's book differs from conventional history of education, whose scholars focus on youth and childhood in their usual school or family environments. His study uncovers many neglected types of relations that connect youth to (adult) society. . . Fisher's book is a powerful study of intellectuals' vision of youth in post-World War II Germany." Disciplining Germany is a welcome addition to and firm departure from current studies of postwar reeducation and Vergangenhitsbewåltigung: by displaying the subtle manner in which politics played into the narrative and philosophical discourses on youth and generation, Fisher skillfully illuminated the political role of the cultural imaginary of youth in the budding German nations."